President Trump speaks at Snap-On Tools Corp. headquarters in Kenosha, Wisconsin, on April 18, 2017. For seven years, Republicans ran and won on the idea that they had a plan to repeal Obamacare and replace it with something better and cheaper. When they finally got the opportunity to turn these promises into an actual law, all they could come up with was a plan that would drive up costs for older, sicker, and poorer Americans, and leave millions uninsured. The effort failed so spectacularly that they had to cancel the House vote at the last minute. Now Republicans have reverted to a more comfortable stance, constantly promising that Zombie Trumpcare will be revived any day now — maybe as soon as this week. In the last week the White House came close to repeating this pattern by suddenly demanding that funding for the southern border wall be included in an appropriations bill that must pass by Friday at midnight to keep the government funded. While this is one of several “poison pills” that could spark a government shutdown, sources told Politico that the Trump administration was pushing for the funding due to “internal pressure to show legislative achievements ahead of the 100-day mark” — which just happens to come on the same day that the shutdown would start. But it appears that the health-care debacle taught President Trump something about the perils of trying to turn a perfectly good political fantasy into reality. Or maybe Trump sensed that the conservative journalists he hosted at the White House on Monday didn’t think he should risk marking his 100th day with a government shutdown, and he told them what they wanted to hear. The reception was supposed to be a casual gathering for conservative reporters, but when the president arrived it morphed into an on-the-record question-and-answer session. 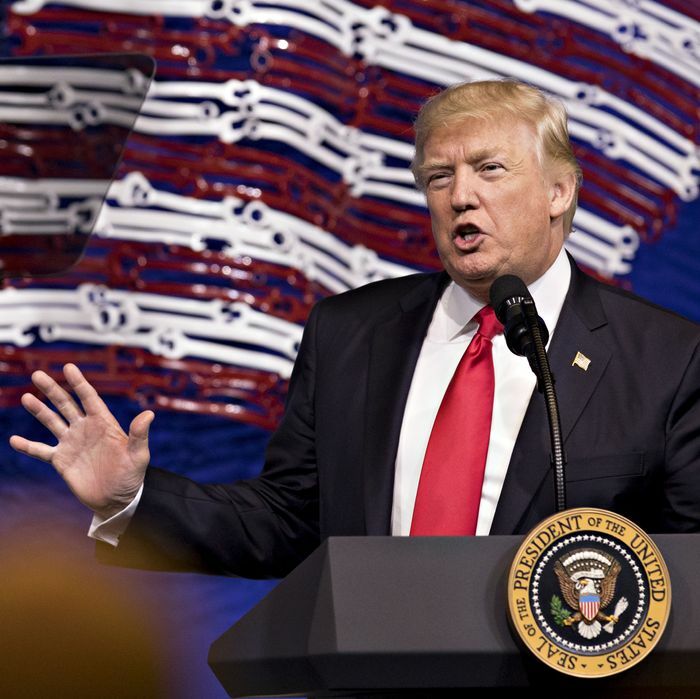 Trump told the press that he’s open to leaving funding for the border wall out of the current spending bill, and pushing off the fight to September, when another funding bill will be needed. That will likely allow Republicans and Democrats to reach a deal quickly. Before the White House began pushing for a down payment to begin construction on the wall, both sides said they would be willing to increase funding for the military and other border security measures. A month ago, the Trump administration asked Congress to add $33 billion in new defense and border spending to the spending bill, including $1.4 billion to start building the southern border wall. According to Reuters, an internal Department of Homeland Security report estimated that the wall would cost $21.6 billion, and take more than three years to construct. Senator Lindsey Graham went even further, admitting that the wall isn’t a literal wall at all. The president is obviously very eager to show off this cheap, 30-foot-high, 2,200-mile wall that ends the drug war and meets all the requirements for “aesthetics, anti-climbing, and resistance to tampering or damage,” as stated in the guidelines for contractors submitting prototype designs. It’s too bad he won’t be able to get the project going until September — or some other indefinite point in the future.